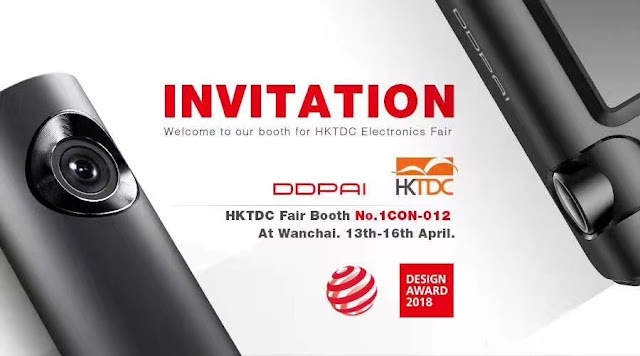 DDPAI Intelligent dashcam company is attending the HKTDC electronics show in Exhibition Centre of Hong Kong from April 13-16, 2018. Brilliant products including iF, Reddot awarded series will be showcased on the show. Electronics fair by HKTDC is one of the biggest trading show in Asia, which presents professional trading information, communication and technology companies to showcase their state-of-the-art software solutions and services. The fair is located in the Exhibition Centre of Hong Kong，attracting buyers and exhibitors from all over the world. Intelligent dashcam is gradually replacing the traditional dashcam. Brand concentration continues to improve, whileDDPAI dashcam takes up the second share of the Chinese market. Thanks to the effective R&D team, DDPAI presents several ultra design products and honorably awarded by the iF and Reddot Design Awards, which will be released to the overseas market on the show. Brand new products include X3pro, the dual camera with eMMc built-in memory system, 1600p resolution, reaching the highest pixel level on dashcam. X3pro presents field protecting function and motion detected-awake system for 24/7 parking monitoring, with the 4G box (accessory exclusive for X series), vehicles will be never out of control. Notifications and automatically token videos can help to keep eyes on cars remotely and effectively. We are sincerely inviting to meet us on our booth (1CON-012) and experience the genuine high quality dashcam. DDPAI set up the office in Shenzhen with 200 staff, including over 70 elite R&D departments, provides firmware and software of dashcam. After years of corporation, DDPAI established high level connection with our global chipset strategic partner -- Hisilicon, ensuring every product from the company presents genuine resolution in this field.